As he departed the White House, the president said Puerto Ricans "have to give us more help"
Touring a small slice of Hurricane Maria's devastation, President Donald Trump congratulated Puerto Rico on Tuesday for escaping the higher death toll of "a real catastrophe like Katrina" and heaped praise on the relief efforts of his administration without mentioning the sharp criticism the federal response has drawn. "Really nothing short of a miracle," he said of the recovery, an assessment at odds with the despair of many still struggling to find water and food outside the capital city in wide swaths of an island where only 5 percent of electricity customers have power back. The governor of Puerto Rico said late Tuesday that the official death toll has been increased to 34 from 16. In the heart of San Juan, in fact, a few miles from the air base where Trump gave his thumbs-up report on progress, people stacked sewage-fouled clothes and mattresses outside houses and businesses lacking electricity nearly two weeks after the storm. "Nobody's come," said Ray Negron, 38, collecting debris in the Playita neighborhood. 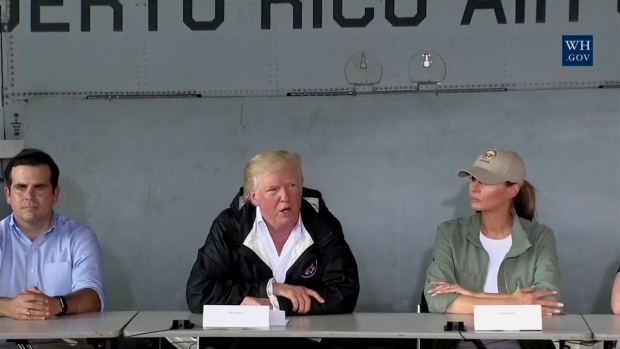 Trump pledged an all-out effort to help the island while adding, somewhat lightly: "Now I hate to tell you, Puerto Rico, but you've thrown our budget a little out of whack because we've spent a lot of money on Puerto Rico. And that's fine. We've saved a lot of lives." Known deaths from Maria in the U.S. territory stand at 34. But local officials caution that any accounting of death and destruction is far from complete as people suffer secondary effects from thirst, hunger and extreme heat without air conditioning. As for Katrina, as many as 1,800 people died in 2005 when levees protecting New Orleans broke, a toll in lives and property that took years to understand. Trump said his visit was "not about me" but then praised local officials for offering kind words about his administration's recovery effort and invited one to repeat the "nice things" she'd said earlier. Trump also singled out Gov. Ricardo Rossello for "giving us the highest praise." "Every death is a horror," he said, "but if you look at a real catastrophe like Katrina and you look at the tremendous, hundreds of and hundreds and hundreds of people that died, and you look at what happened here with, really, a storm that was just totally overpowering, nobody has ever seen anything like this." He told local officials "you can be very proud of all your people, all of our people working together." 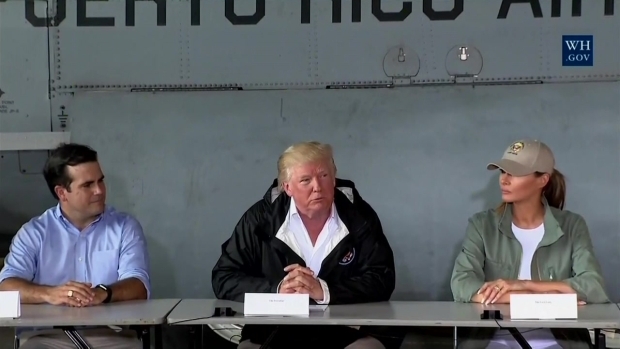 Trump's most prominent critic in Puerto Rico, San Juan Mayor Carmen Yulin Cruz, joined other officials at the air base for a briefing with him, shook the president's hand and said afterward she hoped he now understood the gravity of the situation. But his comment implying Maria was not a Katrina-level event left her unsure. "Sometimes his style of communication gets in the way," she told CNN. "I would hope that the president of the United States stops spouting out comments that really hurt the people of Puerto Rico." On a more positive note, Cruz said: "I saw a real connection between the reality and the White House staff. I think they finally understood." Air Force One brought the president, first lady Melania Trump and aides to Puerto Rico for a tour stretching through the afternoon. At least parts of the itinerary seemed drawn to ensure a friendly reception: Trump visited with selected families waiting on their laws on a street lined with debris, including tree limbs and corrugated metal siding. Trump posed for photos, asked the residents what it was like during the storm and pledged his assistance. "Thank you for being here, it's so good to see you," one man said in Spanish. 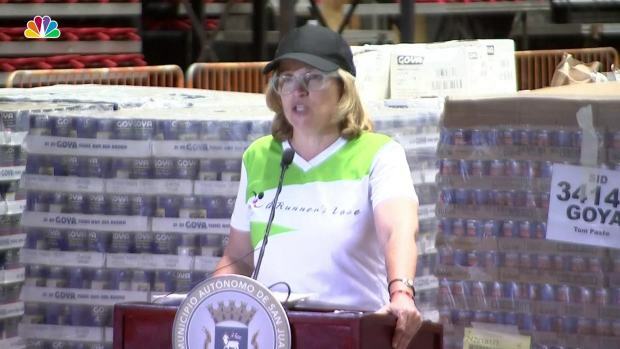 Up the road in the upscale Guaynabo neighborhood, one of the fastest to recover, around 200 people cheered Trump's visit to a local church being used to distribute supplies. Many crowded around him for cellphone photos as he handed out flashlights and tossed rolls of paper towels into the friendly crowd. "There's a lot of love in this room, a lot of love," Trump said. "Great people." Asked by the AP what he has to say to people still without power, food and water, he spoke of the generators brought to the island and said the electrical grid is being fixed. "Again, the job that's been done here is really nothing short of a miracle," he said. "I appreciate your support and I know you appreciate ours," Trump said. "Our country has really gone all out. It's not only dangerous, it's expensive. But I consider it a great honor." As he headed out from the White House to visit the island, Trump told reporters "it's now acknowledged what a great job we've done." Seth Meyers discusses the continuing crisis in Puerto Rico after Hurricane Maria and how President Donald Trump is handling it. The trip is Trump's fourth to areas battered by storms during an unusually violent hurricane season that has also seen parts of Texas, Florida, Louisiana and the U.S. Virgin Islands inundated by floodwaters and hit by high winds. Trump's visit follows a weekend in which he had aggressively pushed back against critics, including Cruz. He had responded angrily on Twitter, deriding the "poor leadership ability by the Mayor of San Juan, and others in Puerto Rico, who are not able to get their workers to help." 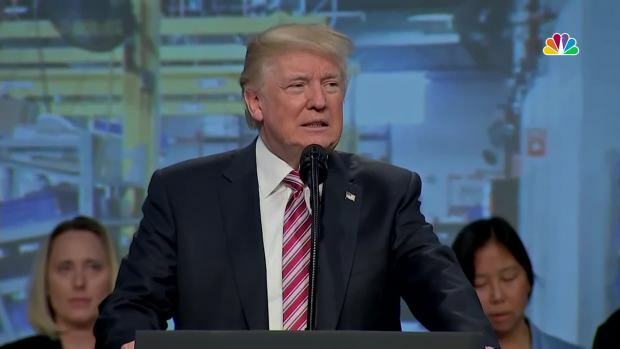 "They want everything to be done for them when it should be a community effort," he added, scoffing at "politically motivated ingrates" who had criticized the federal work, and insisting that "tremendous progress" was being made. Cruz had begged the administration to "make sure somebody is in charge that is up to the task of saving lives" and said federal inefficiency was killing people. Trump and his wife also visited Navy and Marine Corps personnel on the flight deck of the USS Kearsarge, landing on the deck in Marine One. On the flight back to Washington, Trump told reporters he'd heard no criticism while on the ground. 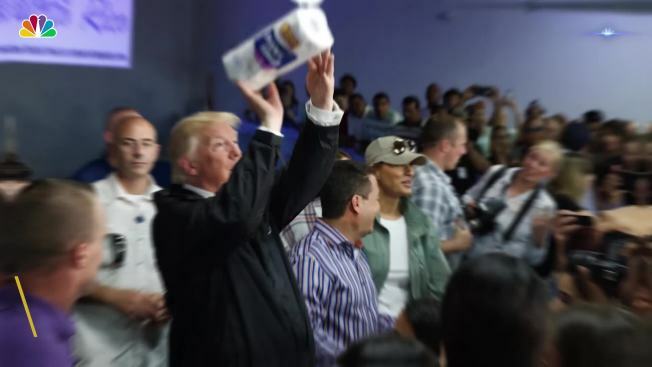 "No, we only heard thank you's from the people of Puerto Rico," he said, adding, "I think it meant a lot to the people of Puerto Rico that I was there." Even before the storm hit on Sept. 20, Puerto Rico was in dire condition thanks to a decade-long economic recession that had left its infrastructure, including the island's power lines, in a sorry state. Maria was the most powerful hurricane to hit the island in nearly a century and unleashed floods and mudslides that knocked out the island's entire electrical grid and telecommunications, along with many roads. The Federal Emergency Management Agency said more than 12,000 federal officials are now on the ground on the island, and 45 percent of customers now have access to drinking water. Businesses are also beginning to re-open, with 70 percent of retail gas stations now up and running. Woodward reported from Washington. Associated Press writers Danica Coto and Michael Weissenstein in San Juan and Catherine Lucey and Ricardo Alonso-Zaldivar in Washington contributed to this report.